Hope you're all having a great Sunday and getting prepared for an awesome week ahead! So how is the weather in the UK? Is it still hot, hot, hot? I hope so! But I do feel for you. It can get so unbearable at night without air-con. I think Mark and I would die if we didn't have air-con here in Spain. That's one thing I don't miss from the UK, trying to sleep during the summer! With that in mind I wanted to share with you a really easy simple meal that I've been having a lot recently. I think it's a perfect meal for those super warm evenings when you can't be bothered to cook, but still want something fairly substantial. 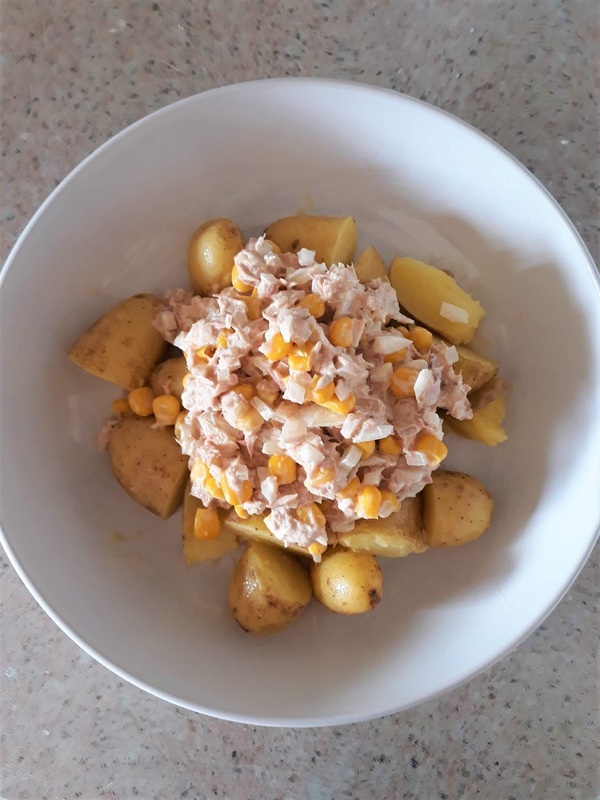 OK, it's new potatoes, tuna, onion, sweetcorn and the all important mayonnaise! I literally boil my new potatoes. Once drained I add in some butter and swirl it round the pots and then pop the lid back on the pan. I like to leave a small gap to let some of the steam out. While they're cooling I mix up my tuna, sweetcorn, onion and mayo. side note - the real stuff, no light or diet mayo in this house! Regular Hellmans mayo all the way! 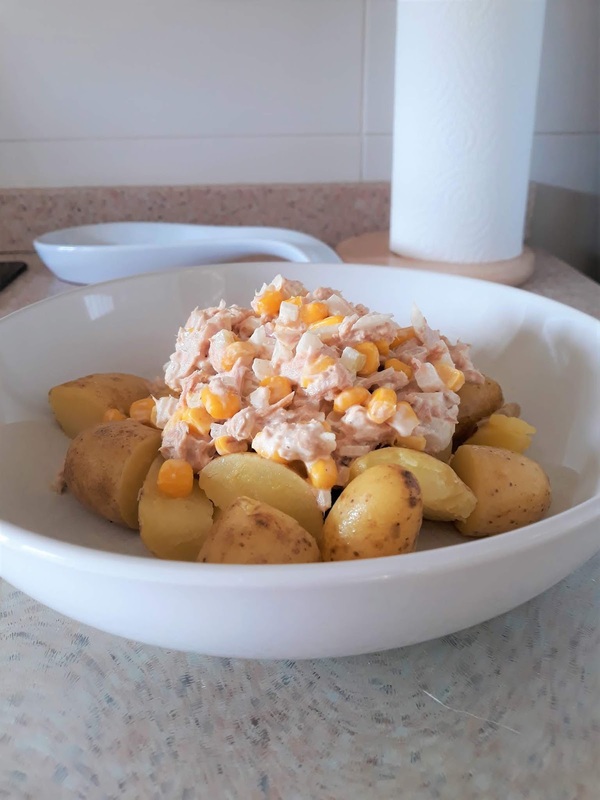 Then pop the potatoes on the plate or shallow bowl like me (which I think is actually a pasta bowl) then dollop the tuna mix on top. So easy, simple and super tasty. Plus you won't be breaking out into hot sweats and getting all hot and bothered while eating this for your dinner. Is this something you would whip up for yourself? What's your go-to dinner for a hot summer's evening? Make sure you've liked the Facebook page for all posts, Insta pics and more!